! NEW ! 04/04/2019 You may have seen on the news, the practice of netting hedges and trees to prevent birds nesting to allow building development to take place. A hedge in Carlton in Lindrick, opposite the Co-op on the main A60, had such a hedge netted. Avant homes have permission to build on the site and had netted a section of hedgerow to prevent birds nesting, as this was to be the main access for the development. This caused quite a bit of upset locally, as the netting was poorly erected. Although centrally the netting was intact, both ends were open so birds could enter, but then be unable to escape. This was tantamount to illegal trapping. Our Conservation Officer was quickly on the case and contacted Bassetlaw Planning Department to find out more. In the meantime the netting was removed by persons unknown. The developers moved in within two days (the day after we contacted Bassetlaw) and took out the section of hedge and began work, with our Conservation Officer on site. Walking around outside the immediate area of development, he did find two Lapwing nests with eggs and pointed these out to the developer's staff on site. The netting of habitats is becoming more widespread and at best is sharp practice. If you come across any netting please check to ensure it is secure with no open ends, gaps, rips etc... that birds could enter through and also check to see if there are any birds trapped inside. Unless we hear otherwise we suggest contacting the RSPCA (Tel: 0300 1234 999) for advice on what to do if you discover birds trapped in this way.
! NEW ! 02/04/2019 Just playing around with the database- there have been 148 species of bird recorded at North Anston Pit Top since the database was created in 1999. That's a pretty impressive tally at what is in effect a colliery spoil heap. Sweepstake on what the 150th species will be? Cetti's Warbler, Great White Egret? 25/03/2019 The field trip on March 24th was to RSPB St. Aidan's with 8 members in attendance. The weather was dry and mainly sunny but with a cold westerly wind. The first job was to find the Little Owl(s) that nest in the dragline. One soon obliged. Walking down from the field centre, 30 Whooper Swans were seen on the flooded ridge and furrow along with many Greylag Geese and Canada Geese. A small flock of geese flew over our heads and settled on the hillside pasture giving us excellent views of half a dozen Pink-footed Geese and a single Bean Goose. On Astley Lake were 2 Avocets and 2 Oystercatchers and a small flock of Sand Martins feeding over the water with a Red Kite overhead. Around the wooded perimeter path Chiffchaffs and a Blackcap were singing and flock of House Martins were overhead. Cutting back through the reedbeds, 4 pairs of Black-necked Grebes were found along with a drake Red-crested Pochard whilst 2 or 3 Bitterns were booming. Small passerines were hard to find in the strong wind but the group returned a total of 57 species (Geoff Facer). 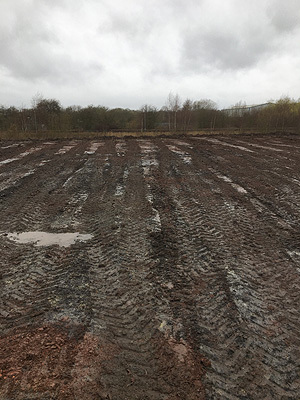 16/03/2019 At NAPT the willows between Bluebell Wood Hospice and the sewage works have been removed- this should open the site up more and attract a few more species. 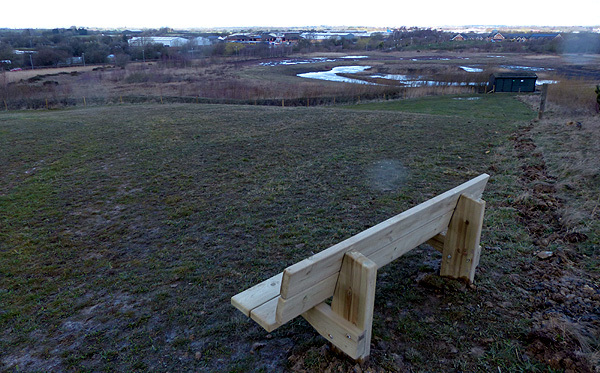 Plus a seat has been installed at the top of the hill behind the hide- this should prove useful for migration watching if anyone cares to get up early! Also, the scrape has some water in it, so as of the weekend of 23/03/2019, the group will commence wardening the hide between 0800-1100 Saturday mornings. 11/03/2019 It's not taken our Conservation Officer long to get stuck into jobs this year! Below the wader scrape at NAPT following works organised by Mick Clay, to reinstate clear areas for Little Ringed Plover to nest. The scrape had become overgrown and unsuitable, with no bird breeding plovers here for two years. Mick has been out again, this time with new Membership Development Officer Paul Bloor & his son Alfie. For Christmas Alfie didn't want the latest Xbox game or a new phone, no Alfie wanted some trees so he could plant them! 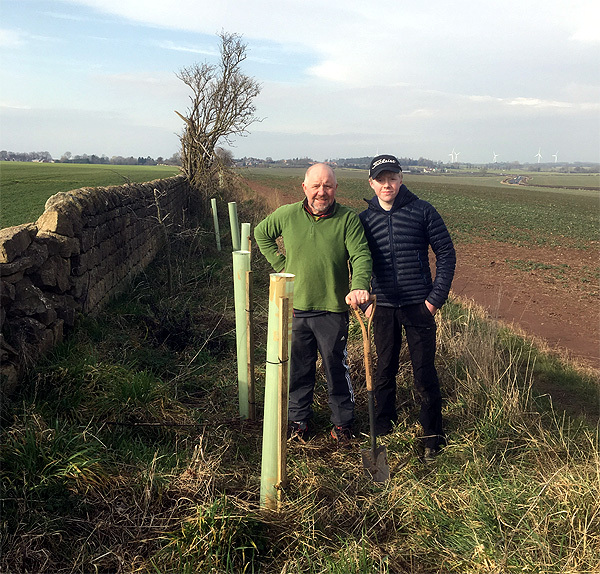 So Alfie & Paul, along with Conservation Officer Mick Clay set to and planted the mix of 65 trees along the wall at Axle Lane. Well done all, especially Alfie! 20/02/2019 The Conservation Volunteers (TCV) have been busy again at NAPT. They've replaced the fencing by the hide, between the gate and the corner of the hide. This should act as a clear deterrent that it's out of bounds- Wildlife Only! 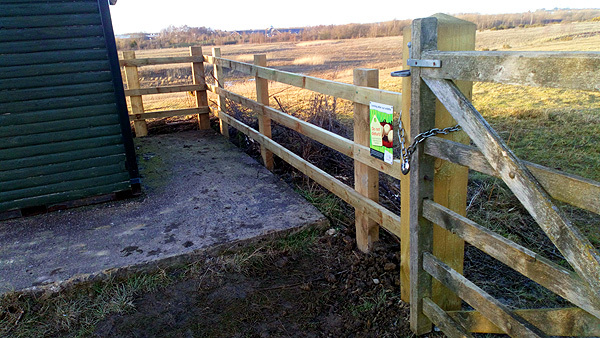 New fence @ NAPT (Dinnington Community Woodland) © TCV (The Conservation Volunteers). 17/02/2019 "Beautiful walk round Shireoaks Pit Top"
04/02/2019 At the end of January the group held it's indoor meeting & AGM. The AGM was brief and all the current post holders were reelected (click here to see who carries which role). We were delighted to elect Mick Clay to the role of Conservation Officer and Paul Bloor to the role of Membership Development Officer. Following the reports from the various group organisers Geoff Facer gave the group a wader ID masterclass, which seemed a popular format of question and answers, using various audio visual props. Something I'm sure we'll do again. We also welcomed six new members to the group. 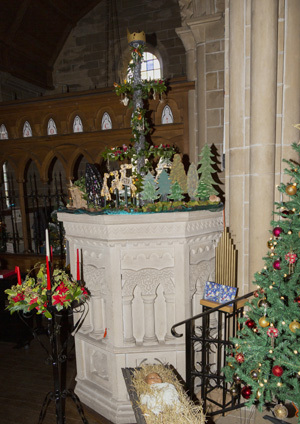 22/01/2019 In an attempt to encourage Peregrines to nest in the area, Mick Clay constructed a nesting platform and sought permission to place it on the parapet at the church in South Anston. On Sunday several members helped Mick put the platform in position. Lets hope they make use of it! 01/01/2019 A HAPPY NEW YEAR! A reminder the group holds it's AGM at the 30th January indoor meeting. Anyone wishing to stand or offer help with the running of the group should let the recorder- Andy Hirst know prior the the AGM. We currently have several positions to fill, covering the Secretary's role and Publicity/ Membership Development. And of course any help with general tasks would be greatly appreciated. A further reminder to submit all of your 2018 records to the Recorder ASAP, so we can correlate and pass them on to the YNU. We have a database which you can use to enter your records, or an Excel spreadsheet, which means we can input your records directly in to the groups master database. However records are welcome in any format. We've reviewed the list of species which require descriptions and have removed Marsh Harrier from this list. Given the increase of this species around SK58 (Idle Valley, Potteric etc...) the number of records will no doubt increase, making Marsh Harrier less scarce locally. 25/12/2018 Did you receive a smart phone for Christmas? Did know SK58 Birders has it's own Bird News Service? 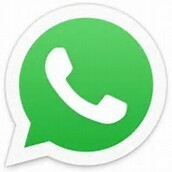 We have a "WhatsApp" group dedicated to broadcasting immediate bird news to members. It works on either iPhone and Android phones. Simply search, download and install the free "Whats App" app from the store on your device- then let our Recorder have your mobile phone number. You'll be added to the group, and then you'll receive news and updates on SK58 Birds straight to your phone as well as being able to broadcast to other members, any good birds you find within the square. 17/12/2018 Mick Clay informs us the farmer has planted 3 larger trees at Axle Lane and will look again in the spring to see if he needs to plant anymore. If you recall an overzealous employee chopped down all the trees the group planted a few years ago (scroll down for full story). Don't forget at the January indoor meeting, we hold our brief AGM. At this moment in time, all the current incumbents in the various roles are willing to stand for another year. However we do have several vacancies within the group, so if you are interested in possibly becoming our Secretary, Publicity/ Membership Development Officer, or simply wish to offer some time towards group activities and events, then do please let Andy Hirst know before the AGM, ideally before the Organisers meeting on the 23rd January so we can ensure you make your intentions known at the AGM. 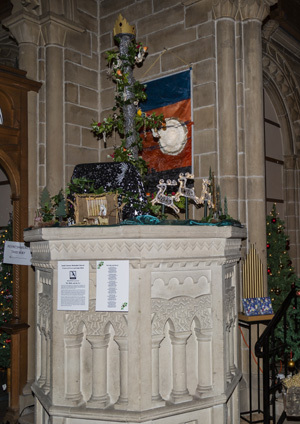 08/12/2018 Once again SK58 Birders have contributed a tree to the South Anston Methodist Church Tree & Light Festival. And once again, thanks to Susan Parker and Paul Tennyson we have adorned a tree, plus an environmental message reflecting the groups interests. click here for further details and opening times to view the trees and lights.